Despite being overwhelmed by the transformation of their tiny two-and-a-half bedroom cottage into a huge family home for nine, Brooke and Grant showed their appreciation by scoring strategically instead of fairly. The couple scored Candy and Ryan a 5 for their kitchen and kids’ bedroom zone which earlier received the first 9 of the series from Home Beautiful judge Wendy Moore, who described their work as “genius”. Traditional rivals Queensland sympathised with their competitors. Lloyd stated he was “angry and upset for Candy and Ryan” before he and Maddi came in for similar treatment, receiving a 5 for their zone. “They’re obviously on the bottom for a reason,” said Lloyd, who received an 8 from both judges. “And by giving out these low scores they’re [Brooke and Grant] trying to drag everyone else to the bottom with them. 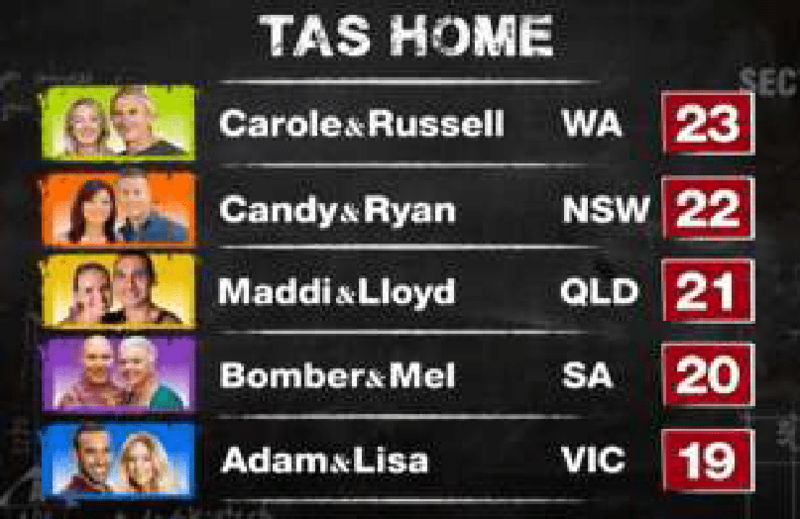 In the overall rankings, WA’s Carole and Russell went from last place to first with their living room, master bedroom and toilet. Judge Joe Snell said the master bedroom was “the most complete room in the whole house”. Team SA narrowly avoided finishing last. Bomber and Mel failed to complete a main bathroom for the second time, and their kids’ zone had safety issues. Over-confidence and complacency again plagued the recently-paired couple whose efforts this week were described as “disappointing” by the judges, especially given SA had the advantage of choosing its zone. The Victorian team felt the couple, who have the lowest mortgage in the competition at $258,000, were ungrateful. “They’ve been blessed with what they got,” said Adam. “Giving them an extension and a renovation? And the scores definitely didn’t reflect that. Let’s score appropriately.” Lisa broke down in tears after receiving the judges’ score, walking off set at Home Base despite Wendy suggesting the team could be the “dark horses” in the competition if they improve their workmanship. Brooke and Grant scored Victoria a 6 which relegated them to last place and another stay in the tent for the next renovation which takes place in Queensland. House Rules airs 7:30 Tuesday and Wednesday (8 PM Thursday in NSW and QLD due to State of Origin) 6:30 PM Sunday and 7:30 Monday on Seven.